This is an old revision of this page, as edited by Voidxor (talk | contribs) at 00:14, 22 September 2016 (→‎Differential diagnosis: Capitalization. Rm duplicate link per MOS:DUPLINK.). The present address (URL) is a permanent link to this revision, which may differ significantly from the current revision. For other uses, see Rash (disambiguation). A rash is a change of the skin which affects its color, appearance, or texture. A rash may be localized in one part of the body, or affect all the skin. Rashes may cause the skin to change color, itch, become warm, bumpy, chapped, dry, cracked or blistered, swell, and may be painful. The causes, and therefore treatments for rashes, vary widely. Diagnosis must take into account such things as the appearance of the rash, other symptoms, what the patient may have been exposed to, occupation, and occurrence in family members. Rash can last 5 to 20 days, the diagnosis may confirm any number of conditions. The presence of a rash may aid diagnosis; associated signs and symptoms are diagnostic of certain diseases. For example, the rash in measles is an erythematous, morbilliform, maculopapular rash that begins a few days after the fever starts. It classically starts at the head, and spreads downwards. Allergies, for example to food, dyes, medicines, insect stings, metals such as zinc or nickel; such rashes are often called hives. Acne vulgaris Comedones, papules, pustules and nodules. Face, chest and back. Acne rosacea Flushed appearance or redness. Cheeks, chin, forehead or nose. Irritant contact dermatitis Red, itchy, scaly, or oily rash Eyebrows, nose, edge of the scalp, point of contact with jewellery, perfume, or clothing. Measles Red rash that is raised with a fever or sore throat. Usually starts first on the forehead and face and spreads downward. Chickenpox Multiple blisters with a fever, cough, aches, tiredness and sore throat. Usually starts first on the face, chest and back and spreads downward. The causes of a rash are numerous, which may make the evaluation of a rash extremely difficult. An accurate evaluation by a provider may only be made in the context of a thorough history (What medication is the patient taking? What is the patient's occupation? Where has the patient been?) and complete physical examination. The appearance: e.g., purpuric (typical of vasculitis and meningococcal disease), fine and like sandpaper (typical of scarlet fever); circular lesions with a central depression are typical of molluscum contagiosum (and in the past, small pox); plaques with silver scales are typical of psoriasis. Symmetry: e.g., herpes zoster usually only affects one side of the body and does not cross the midline. A patch test may be ordered, for diagnostic purposes. 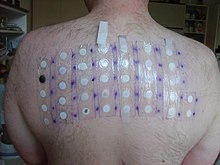 Treatment differs according to what rash a patient has been diagnosed with. Common rashes can be easily remedied using steroid topical creams (such as hydrocortisone) or non-steroidal treatments. Many of the medications are available over the counter in the United States. The problem with steroid topical creams i.e. hydrocortisone; is their inability to penetrate the skin through absorption and therefore not be effective in clearing up the affected area, thus rendering the hydrocortisone almost completely ineffective in all except the most mild of cases. ^ a b Fisher, Alexander A. Fisher's Contact Dermatitis. Retrieved 2014-04-24. ^ Rebecca B. Campen M.D. The Comprehensive Guide to Skin Care: From Acne to Wrinkles, What to Do (And Not Do) to Stay Healthy and Look Your Best. Retrieved 2014-04-24. ^ "Hydrocortisone for mild inflammatory skin conditions". patient.info. Look up rash in Wiktionary, the free dictionary. Wikimedia Commons has media related to Rash.